Lifestyle Villas proudly presents Villa Penasco. Treat yourself to all the amenities of a six-star resort, but with the expansive space and privacy of this stunning oceanfront home. 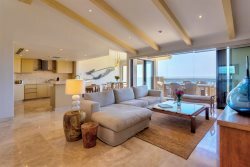 Perched high on a cliff overlooking Land’s End, where the Sea of Cortez meets the Pacific Ocean, Villa Penasco offers the ultimate in natural beauty and first-class luxury. On the spacious main terrace, take in the magnificent ocean view from the Jacuzzi or infinity pool as you listen to the soothing sounds of its waterfall. The terrace also features a Palapa shade structure complete with an elegant bar, refrigerator and barbecue, all perfect for outdoor entertaining. Inside, the villa offers a state-of-the-art gourmet kitchen. The scenic dining room seats 16, and fully opens to the main terrace. After dinner, relax around the large stone fireplace in the living room. When day is done, choose from five beautiful bedrooms. Each has a full marble bath, private terrace, TV, refrigerator, safe, and fabulous view. To meet your business needs, Villa Penasco provides a boardroom with a large-screen, surround-sound theater system, computer, high-speed, wireless Internet, 300 DVD movie collection, library, and fax machine. Other special amenities include a fitness room and keycard security access system. Villa Penasco’s live-in staff is on hand to meet your every need. Conveniently located in the exclusive, gated community of Pedregal in Cabo San Lucas, this premier estate features the best in luxury, security, service, and scenic splendor. Villa Penasco and your Lifestyle Team await you.